The most romantic city in Italy, Venice is a city like no other. Truly unique in layout, architecture and style, if you ask me, more beautiful than this, it’s impossible in Italy (maybe Rome, but I’m biased). There are many ways to enjoy the city, but if you want to delve into its history, art and main highlights, we found the best Venice tours for you. I’ve often heard that Venice either you love it or hate. Maybe it’s true, for sure, you need to arrive with peace of mind and ready to face the crowd because it’s hardly low season. Also, humidity is a big factor in Venice, both summer and winter, and floods do happen. But you know what? When Piazza San Marco is flooded, the level of beauty skyrockets. Besides, pack a pair of rain boots and you will be fine. Ready to enjoy Venice? Affordable and perfect for a good start, this Welcome to Venice Walking Tour by Take Walks lasts for about three hours and is for a maximum of 12 people. 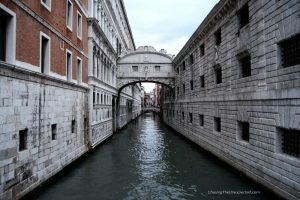 One of the best Venice walking tours, this is an introduction to the city and includes both walking and a gondola ride. You will explore Venice and visit some of the main highlights such as St. Mark’s Square and Basilica (with a skip-the-line entrance), Rialto Bridge and fish market, the Grand Canal, the house of Marco Polo and Cannaregio in the Jewish Ghetto, Europe’s oldest. Your tour will end with a gondola ride, so after learning about the history and the life in Venice throughout the centuries, you can relax and enjoy the city from its waters and its highlights from another angle. Spend the whole day exploring the city with this great Venice walking tour, perfect for who can’t stay for too long and still wants to see as much as possible in a limited time. You will start the day at the Rialto Bridge and learn the origins of the city from the lagoon and how this unique layout and the sea influenced Venice history, culture and life. The tour will take you to Rialto fish market and some backstreets and alleys for a glimpse of the traditional life. You will go past the house of Marco Polo, you will visit local churches and see the masterpieces of local painters, before your expert guide will take you on a gondola ride, so that you can travel through the city just like locals do, from the water. Obviously, you won’t miss the main highlights, such as Palazzo Ducale to see where the Duke of Venice lived and Basilica di San Marco, for which skip-the-line tickets are included, Piazza San Marco and Ponte dei Sospiri (Bridge of Sighs). ⇒ Tip: Click here to buy online the public transport ticket for 75 minutes or 24, 48 and 72 hours. If you can stay in Venice for longer than a day and can explore both the touristy and the more offbeat side of the city, you can start with this tour where you will learn in depth the history, the art and the anecdotes behind two of the main highlights, Basilica San Marco and Palazzo Ducale. Your tour will start at Piazza San Marco and you will skip the line to enter St. Mark’s Basilica to admire its wonderful mosaics and precious Pala d’Oro altarpiece as well as look at the Doge’s Palace and the lagoon from the balcony of this unique church. After that, you’ll access the Doge’s Palace with a skip-the-line admission and walk through the rooms, the armory, the prison alongside listening to the dark tales and facts that happened among those walls. This is one of the favourite tours of Venice which will give a wealth of knowledge about one of Italy’s jewels. One of Italy’s most touristy destinations, with this Venice tour you will also explore some more offbeat corners of the city. In this special Venice tour, you will visit the secret chambers of the Doge’s palace, Casanova’s prison, the torture chamber, secret archives, interrogation rooms and how the world of politics in the Middle Ages was organised in this mysterious and powerful city. After exploring the hidden areas of the Palazzo Ducale, you will visit places like the Hall of the Great Council, where the public affairs of the city took place, the famous Bridge of Sighs (and learn the history behind it) as well as the other rooms of the duke’s palace. This tour of Venice will also take you to the famous Byzantine St. Mark’s Basilica so you can admire its wonderful mosaics and its treasure that includes the Pala d’Oro altarpiece, learning about the history and the art of the church from an expert guide. In this great VIP tour in Venice, you will visit the main highlights of the city after closing time. You will start your Venice evening tour at the Doge’s Palace, once the pulsing heart of the maritime republic and where the decisions were taken. Your guide will give you all the historical information you will need to understand the past of this beautiful city and the events that made it a powerful and rich empire. Inside the palace you will see the paintings of artists such as Veronese and Tintoretto, you will visit the Hall of the Great Council and the 18th-century prison, before crossing the Bridge of Sighs. The tour also gives you the chance to enjoy the always crowded St. Mark’s Basilica and its wonderful mosaics in silence and with the only presence of your guide and small group. Explore the stunning architecture and decoration of one of the world’s most beautiful and famous churches in one of the best tours of Venice. If you would rather visit only St. Mark’s Basilica after the crowds, this Venice tour is for you. This will give you a great chance of exploring this unique church with an intimate visit to enjoy its decorations and learn about its history with your expert guide. You will admire the basilica from outside first, its beautiful piazza, to inside to visit the mosaics, the crypt and the Pala d’Oro altar masterpiece, which require an extra ticket and queue during the day but not in the evening. Your knowledgeable guide will pepper the tour with storytelling, anecdotes and the history of the place so that you will get to know the city, its culture and its memorable past. If you’d rather buy only the ticket without a tour, you can purchase online a skip-the-line admission. Click here for the Doge’s Palace, here for St. Mark’s Basilica and here for St. Mark’s Bell Tower. With this tour, you will explore Venice from another angle, its waters. Which is where this ancient republic took most of its power and fame from. As you will travel on a small motorboat, the group will be of less than ten people, which will allow you to better understand and take part in the trip. 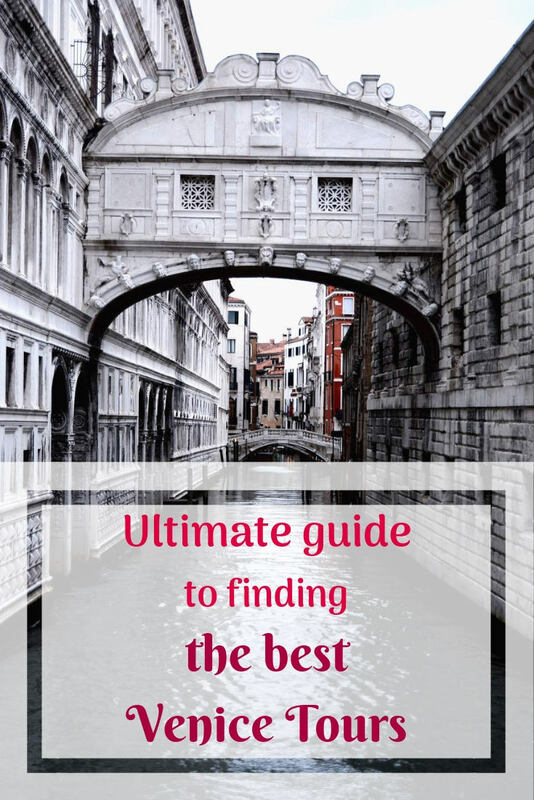 In two hours, with the explanations of an expert guide, you will pass by important landmarks like Piazza San Marco (St. Mark Square), Doge’s Palace, Rialto Fish Market, Rialto Bridge and Ponte dei Sospiri (Bridge of Sighs). One of the best Venice tours, you will finish at San Giorgio Island with a visit to the basilica and the chance to climb its bell tower for a gorgeous view of the city. ⇒ Tip: Book online the bus transfer between Marco Polo airport and the city centre. 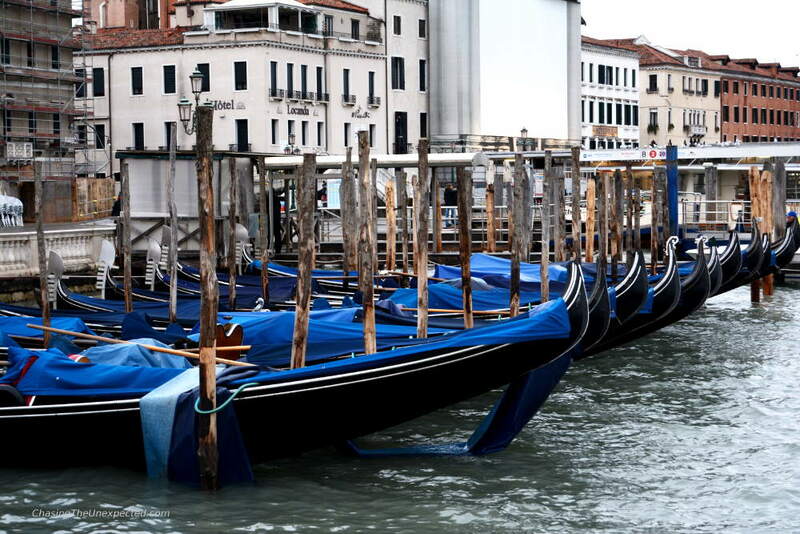 If you prefer a shared water taxi from Venice airport to your hotel, click here. A cheap guided tour in Venice is the one that will take you to La Fenice Theatre, one of the world’s most famous Opera theatres. Your guide will tell you about the history of the theatre, the operas that have been set here, such as “Beatrice di Tenda” and “I Capuleti e i Montecchi” by Vincenzo Bellini, and “Sigismondo”, “Tancredi” and “Semiramide” by Gioachino Rossini, as well as the decoration of the place. If there is a thing Venice is famous for apart its unique landscape is its annual Carnival. In this unusual workshop, you can make and paint your own mask. You will also learn about the old techniques used in this traditional festival throughout the centuries as well as what the masks were for. 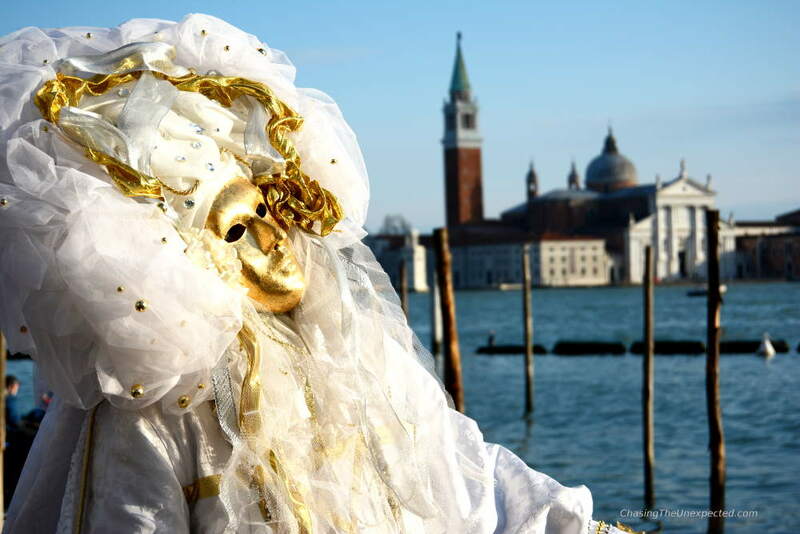 After painting a mask of your choice, you can take it home with you as a truly special souvenir from Venice. Venice also has a vibrant cultural scene and to discover it, you can visit the modern artwork of the Peggy Guggenheim Museum and Leonardo Da Vinci Museum with a skip-the-line entrance to learn about the life and work of one of the world’s greatest painters, architects, draftsmen and engineers. One of the favourite food tours in Venice, this day out with Take Walks will take you to the traditional neighbourhoods and places where the local delicacies are made. You will discover and experience the Venice way of eating and sample local treats. Starting your tour at the Rialto Fish Market where locals shop for their meals, as fish is a great part of Venice traditional cuisine. After learning about the local culinary tradition, you will go out and about exploring and tasting, discovering both great places and great recipes. Try the famous cicchetti, the Venetian way to cook the baccalà (salted codfish), enjoy some bruschette and crostini, and obviously taste some prosecco wine. You can’t say you experienced Venice without a tour on a gondola and a jaunt to the Jewish quarter. Here you will visit Cannaregio, the place of some great local eateries. This is a great tour in Venice where you can not only tuck into local treats but also discover some pretty nice restaurants thanks to an expert local guide where you can always come back by yourself. With this affordable Venice food tour, you will discover with the help of a local some of the traditional treats and some places where to try the best ones. Your guide will take you to sample the famous “cicchetti” paired with some local wines at local “bacari” wine bars. You will visit several locations and taste something different in each of them. To complete the Venetian scene, the tour will end with a gondola ride. Walk around Venice main highlights and at the same time discover its cuisine with this food walking tour that starts at the Rialto food market. Visiting local restaurants, bars, osterias and markets, you will experience the local way of shopping for the necessary ingredients, discover the regional dishes as well as great places where to sample them. 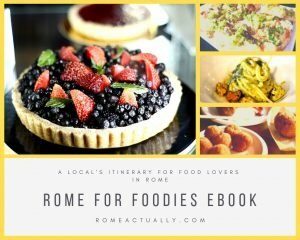 In this Venice food tour, you will meet food artisans and local producers and will have enough food for a whole meal. This food tour in Venice, too, starts at the central hub of shopping for fresh produce, the Rialto Market, but instead of only tasting the local dishes, here you will also learn how to make them. After visiting the market, in fact, your guide will take you to a traditional palazzo where you will have a nice cooking class with a chef to learn how to make pasta and some sauces. You will then enjoy your own meal obviously paired with the right wine. Verona is a gem and if you don’t have enough time to make it a longer stop during your holiday, try at least to include it as a day trip from Venice. Rest assured, you won’t regret it. Some of the places you will visit are always the main highlights of Verona. Starting from Piazza delle Erbe, gorgeous piazza built where in Roman times was the forum and that has always been the heart of the social, economic and religious life. Surrounded by buildings, palaces, towers, statues and architectural styles belonging to different eras, it covered several functions throughout the centuries. Your visit will carry on with some of the other key landmarks, such as Verona cathedral, the famous Arena, the Roman amphitheatre that now hosts beautiful Opera shows, and, needless to say, the houses of Romeo and Juliet to also learn about the history and the myth surrounding the love story made immortal by Shakespeare. A perfect day trip from Venice, Verona is one of those underestimated jewels Italy is full of. A cheap day trip that you can do from Venice is to Burano, Murano and Torcello islands of the lagoon by motorboat. In half a day you will visit the beautiful Murano and a typical glass factory that produces the colourful blown glass, you can admire the picturesque houses of Burano and then head to Torcello, the “eternal island”, source of inspiration for Hemingway. The tour includes a local guide on the boat who will tell you everything you need to know to start exploring each island on your own. With this great day trip from Venice, you will explore the nature of Veneto region and the famous village of Cortina as well Misurina and Auronzo lakes. 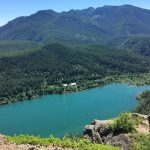 This is definitely a different experience from the art and history of cities like Venice or Verona as what it will entail is soaking in unspoilt nature and breathing fresh and clean mountain air. You will visit high peaks, traditional villages, enjoy beautiful views, take a cable car if the weather allows and also have some free time to explore the area by yourself. If you are short on time and there are many places you want to visit in Italy, I suggest you take a tour with a reliable company. Both G Adventures and Intrepid Travel organise great tours in Italy and many of them include also Venice. Some of the best Italy tours by G Adventures that include Venice are Ultimate Italy, Winter in Italy with Venice Carnival or even France and Italy Adventure. Among the tours by Intrepid Travel are 15-day Best of Italy and 8-day Highlights of Italy.